Observation - Blackbird Feeding on Fatballs - UK and Ireland. Description: Not that I'm suggesting Blackbirds don't like fat balls; but I rarely, if ever, see them on my feeder. 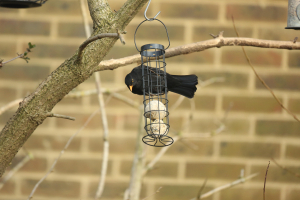 Not that I'm suggesting Blackbirds don't like fat balls; but I rarely, if ever, see them on my feeder.